Chairs and Tables have sourced its teak (tectona grandis) from the island of Java. The teak used comes from ecologically managed and sustainable plantations in Central Java, Indonesia, which are now owned, managed and regulated by the Indonesian government agency, Perum Perhutani, which are responsible for managing a strict policy regarding the size and quantity of trees felled each year together with annual replanting. All our timber is traceable back to the plantation. Please beware of some other retailers who are trying to pass off lesser grades of teak as "A" grade. 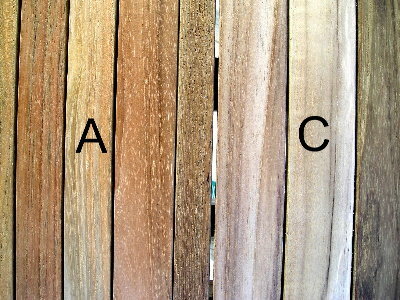 The colour of the teak should be consistent thoughout each piece of wood and avoid teak that is very pale. Mature teak should be a brown colour whereas yellow teak is usually harvested from young immature trees or from the outermost part of the tree, know as "sapwood". There is a significant difference between the two types of wood in terms of the longevity and strength of the furniture produced. Our teak does not need to be treated with teak oil or any other product. How durable is teak? The first outdoor teak benches were made of recycled decking from old sailing ships. Many public parks in England are furnished with such teak benches, some of which are nearly a century old. Well made teak outdoor furniture is typically classic in design with clean architectural lines and timeless style. This is an important attribute for something you could expect to have on your patio for several decades. Durability and timeless design make teak outdoor furniture one of the best values available in home furnishings. Divide the cost of a fine quality teak dining set over the number of years of expected use and you will find our furniture is a very good investment. At chairsandtables.co.uk we use only Grade "A" teak. Components are visually matched to a high degree of colour uniformity. There are minimal "live" knots and no dead knots or sap lines. Natural teak if left outdoors will gradually weather to a silver grey colour. This would probably take about 9 months depending on the amount of sun and rain it has been subjected to. Small cracks (known as checking) and very slight warping may appear, this is a characteristic of all hardwood timbers and will not affect the strength or durability of the furniture. This is due to changes in the seasons and the wood releasing or drawing moisture from the atmosphere. Checking and possible slight warping is not to be considered as a defect. We get often the question if we sell FSC teak. More and more customers are concerned about the legality of the wooden garden furniture they are buying; as well becoming more sceptical about wooden garden furniture that has been made of wood from tropical rain forests. At this moment there is very limited supply of good quality teak wood with FSC label available in the market. Some teak wood from South American plantations has the certification of teak but the availability is limited and the quality of this teak is not as nice as the 2 most famous producers of teak: Myanmar (before known as Burma) and Indonesia. This is changing slowly with more and more plantations achieveing certification within Java. The most garden furniture produced in Vietnam comes from teak wood from Africa, Laos & Cambodia and Burma. - African teak wood is mostly young teak wood with a lot of sapwood and the legality of the wood is very doubtable. - Laos and Cambodia teak is less in quality with many dead knots and definitely comes from tropical rain forests. All environmental organisations are protesting against the further logging in these countries. - Burmese teak is maybe the nicest teak wood available on the market. Nice performance but with a very bad background. The Burmese military government needs the money of the teak export to finance the military regime and is logging the tropical rain forests in fast tempo. All NGO's are warning strongly not to support the military regime in Burma and to stop the fast deforestation of Miramar; they warn for a huge ecological disaster in the coming decades when the deforestation of Burma continues. In Asia, Indonesia is the only country producing garden furniture from plantation teak. 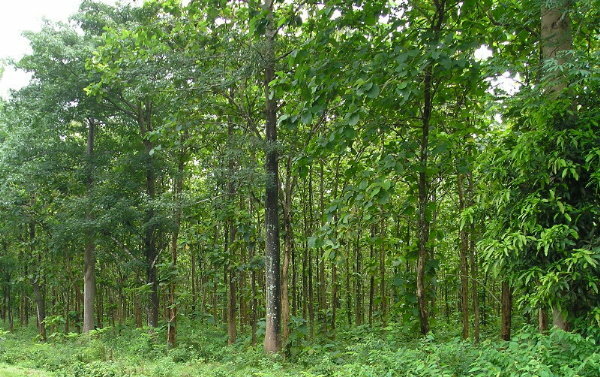 The Dutch planted teak (Tectona Grandis) from high quality around Java. They started the first plantations; the same plantations still supply the wood for the garden furniture industry in Indonesia nowadays. Although the logging went too fast in the beginning 90's of the past century nowadays many reforestation programs are set up and within the next decade many problems of shortage will be solved. Nevertheless the quantity of available teak wood is limited for the moment; the Indonesian government is doing a good job to avoid natural disasters like are happening in Burma nowadays. The Indonesian Government controls the logging of the wood well but still some illegal logging can not be avoided. For teak garden furniture buyers that want to be sure it is important that their supplier has a good Chain of Custody (COC). We at do have such a system that controls the logs "from forests till finished product in the carton". We give you the guarantee that our wood is coming from Javanese plantations and that the wood has been officially purchased from Perum Perhutani, the official governmental organisation that regulates the logging, administration and sales of teak wood (Tectona Grandis) from plantations. Perum Perhutani works together with projects of several Ngo's to insure the logging is environmentally acceptable. We and our manufacturers check the source of the wood until the administration departments of Perum Perhutani to insure the wood is legally logged from highly responsible organized plantations. Legal wood is an issue for us. Legal wood is an issue for our manufacturer. Let legal wood be an issue for you too! When you want to know more about legal teak wood please do not hesitate to contact us. Let 2017 be a good start for the teak forests around Asia and choose for garden furniture made from legal teak wood.